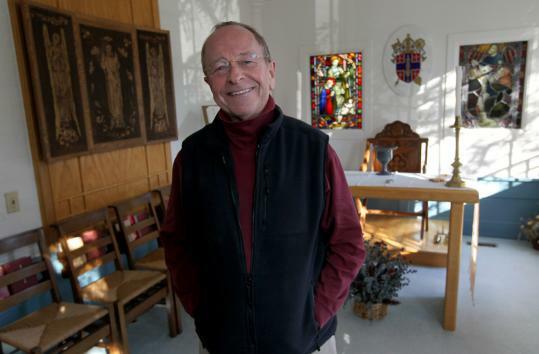 CONCORD, N.H. — V. Gene Robinson, the first openly gay bishop in the worldwide Anglican Communion, may be retiring from his job heading the Episcopal Diocese of New Hampshire in a couple of years — but don’t expect him to vanish from public life. In addition to continuing his ministry to people who grew up without religion or who have had bad experiences with church, Robinson said he plans to become more involved in public policy issues. Religious people on the political left, he said, need to speak more loudly — and provocatively — on behalf of the poor and vulnerable. Robinson, whose election seven years ago created a rift in the Anglican Communion, surprised many when he announced last month that he would retire in early 2013, more than six years before he will reach the mandatory retirement age of 72. His mention of death threats among the many reasons he cited for leaving led to speculation that he felt chased out. But Robinson said that is not true. Being the focal point of so much controversy has been stressful, he acknowledged, on top of a job that is fast-paced and demanding. But he said most Episcopal bishops retire in their mid-60s, and by 2013 he will have served as bishop for nine years. It seemed, he said, like a reasonable time to pursue other interests. Robinson said he did not allow himself to contemplate resigning until the 2009 election of the Rev. Mary D. Glasspool, a lesbian, as assistant bishop of the Episcopal Diocese of Los Angeles. “I think there was a sense that I would remain as an active bishop until there was a sign that this was not an aberration, or mistake, or a one-time event, but was actually a change in our church,’’ he said. In 2006, the Episcopal Church imposed a de facto moratorium on approving new gay leaders, heeding the call of the Most Rev. Rowan Williams, the Archbishop of Canterbury and the honorary head of the Anglican Communion, to pause and consider the potential consequences for the body, which includes 38 provinces with common roots in the Church of England. Robinson’s consecration had alienated traditionalists, particularly in Africa and Latin America, the largest and fastest-growing parts of the church, who believe scripture deems homosexuality immoral, and who threatened schism. But in the summer of 2009, the Episcopal Church — the US province of the communion — lifted the moratorium, and a year ago, Los Angeles elected Glasspool as assistant bishop. The US church confirmed her election last March. The Rev. Adrian Robbins-Cole, rector of All Saints’ Episcopal Church in Peterborough, N.H., said Robinson will be “a hard act to follow.’’ Robbins-Cole is president of the New Hampshire Diocese’s Standing Committee, a board of laypeople and clergy that advises the bishop and that will appoint a committee to search for his replacement. The Rev. Katherine Hancock Ragsdale, president and dean of the Episcopal Divinity School in Cambridge, Mass., said Robinson was elected as bishop in New Hampshire because of his skills and long record of service in the diocese, not because of his sexuality. “His grace under pressure, in the midst of all that, is an important legacy — his refusal to get drawn into responding in kind to the nastiness,’’ she said. Robinson and his husband, Mark Andrew, plan to remain in their home in Weare after Robinson retires. The bishop has begun making forays into the public square, speaking out on state issues such as property tax reform, and writing about religion, politics, and policy issues as a senior fellow for the Center for American Progress, a left-leaning think tank based in Washington, D.C.
“If the Episcopal Church were to start talking about the immorality of the divide between rich and poor in this country, you think there wouldn’t be an outcry? You think there wouldn’t be rich people leaving the Episcopal Church and taking their money with them in protest?’’ he said. “If we were to start talking about the racism that continues to exist in this country, our legacy from slavery, do you think that wouldn’t make people mad? I think if you scratch just below the surface of the Tea Party movement, what you find is racism. The Anglican Communion has not resolved its internal rift over gay leaders. A small number of dioceses and parishes in the US are trying to establish a new, theologically conservative Anglican province in North America and have declared themselves in communion with conservative provinces in Africa. Even if the Anglican Communion dissolves, he said, the ties parishes in the US have built with churches in Africa, South America, and Asia through relief work and social justice projects will continue. “If the Archbishop of Canterbury should proclaim the end of the Anglican Communion, that’s not going to make us stop caring about people in Africa or anywhere else,’’ he said.